5/52 Les Winan Captures the majesty and grandeur of the character. Terrific work by Routh. Can Bryan Singer direct every comic adaptation? 15/47 Amanda Jones Not quite what I was expecting, but a palatable addition to the Superman realm. 17/76 Dan Krovich Generally entertaining, but way too long. 53/68 Michael Bentley A limp effort with a poor plot and mediocre acting. Very disappointing. 82/159 David Mumpower Bryan Singer and X3 both would have been better served if he had directed it instead. The Superman update is deadly dull. 86/200 Max Braden Superman should be bright and optimistic. Leave the dark and creepy to Batman. Never has it been so difficult to make easy money. Warner Bros. has held Superman in limbo for longer should be legally allowed. Due to the fact that the WB owns the characters, there is no real compelling reason to rush the project (say something such as the expiry of rights, etc.). The studio has held on tight to the project and is unwavering in its stand of waiting for the right time. The good news is that Spider-Man was in limbo for seven years before it broke box office records upon its release. For those unfamiliar with the drama surrounding the project, it goes all the way back to 1997 when Tim Burton was given the job of bringing Supes to the big screen. Burton proceeded to cast Nicolas Cage in the role of Supes, much to the shock and horror of everyone who heard of the casting. Somewhere in the pre-production stage, Jon Peters, the producer, enlisted Kevin Smith to re-write the script for the project. Smith's script was shredded to pieces by Peters and Burton and the project stalled. Cage dropped out, then Burton followed. What followed proved to be exciting, yet ultimately heart-breaking. With Burton out, there was a push internally within the WB to make Superman vs. Batman, combining its two franchises to make one giant project to be helmed by Wolfgang Petersen. A power struggle ensued and what could have been the most exciting project in movie history fell by the wayside as execs fought to see who would control a project that was ultimately destroyed by the process. As the project died, so did the chances of seeing the Man of Steel on the big screen. All remained quiet on the Krypton front until Brett Ratner, director of the Rush Hour franchise, was given the reigns to make the film. It is now the year 2000 and Ratner begins pre-production. Rumors began surfacing that his script called for a $225 million budget, so again, the project stalls as the budget needs to be trimmed down. As the project is stalled again, Spider-Man is released and generates $400 million+ domestically and all of a sudden, $225 million is a go. So the only thing left is to cast the title character. Of course, that proves more difficult than it should have been. Ratner and Peters' first -- and arguably only -- choice at the beginning was Josh Hartnett, who turned down the three picture deal that WB demands for anyone who takes the lead role. Hartnett was a no, so the race was on to get a new Superman. As talks continued with the likes of Brendan Fraser and *gulp* Ashton Kutcher, another name surfaced. That name was Matthew Bomer. If you know who Bomer is, chances are you are not a guy. The soap opera star became Ratner's choice to play Superman. Naturally, WB got back on the horn with Hartnett. After Hartnett turned down the role again, the struggle to cast the lead character continued. With Anthony Hopkins rumored to be cast as Supes' father and Cate Blanchett supposedly signed on for Lois Lane, the WB still could not decide on who to cast. As the casting controversy -- and believe us, it was a controversy at this point -- early drafts of the script, as written by J.J. Abrams, leaked onto the internet and suffice to say, it was a piece of garbage. The script changes Superman's origin and, though it contained many (would-be) impressive action scenes, it completely betrayed the myth of Superman. This changing of the screenplay combined with Kevin Smith's frank discussion of how the production on the film moved when he was attached to it lead many to think that the project would eventually be a dud anyway. Undaunted, the search for Superman continued until Brett Ratner, frustrated with the dictatorial Peters, dropped out of the project. From there, Charlie's Angels director McG was brought on board to helm the picture and any hopes of the film being good were quickly stomped on…repeatedly...with much violence. The project is now still spinning its wheels but at least a director is still attached to the project. As of January 2004, there still is no Superman and there are no leading candidates. Names range from the aforementioned Bomer and Fraser to Kutcher and someone named Henry Cavill. 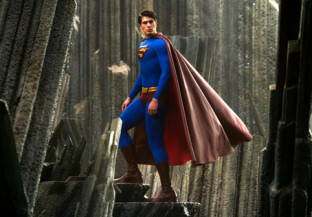 See the latest developments for this project on the Superman Returns Movie News page.